Given by Louis XVIII to the duc d'Angoulême in 1821. Frederick J. and Antoinette H. Van Slyke, Baltimore, Maryland; sold Sotheby's New York, 20 May 1989, lot 103. Nancy Richardson; sold Christie's New York, 23 October 1998, lot 40 (sold after the sale). Mg le duc d'Angoulême, no. 15415, 1 pendule de cheminée montée en bronze doré fonds blanc figures et ornements coloriés relatif à Latone - 2.500. Leto, as related in Ovid's Metamorphoses, was the mother of Apollo and Diana. Thirsty after a long journey, she stopped beside a lake in Lycia but was prevented from drinking by peasants working the osier beds. As a punishment she turned them into frogs. Juno, jealous that Jupiter was the father of both of Leto's children, sent a snake which may be represented by those depicted on the sides of the clock. Jean-Joseph Lepaute (1768-1846), from a distinguished dynasty of clockmakers, recorded at the Place du Palais-Royal, the rue de Richelieu in 1820, and by 1821 at 247 rue Saint Honoré. He was horloger du Roi and horloger de la chambre des Députés. 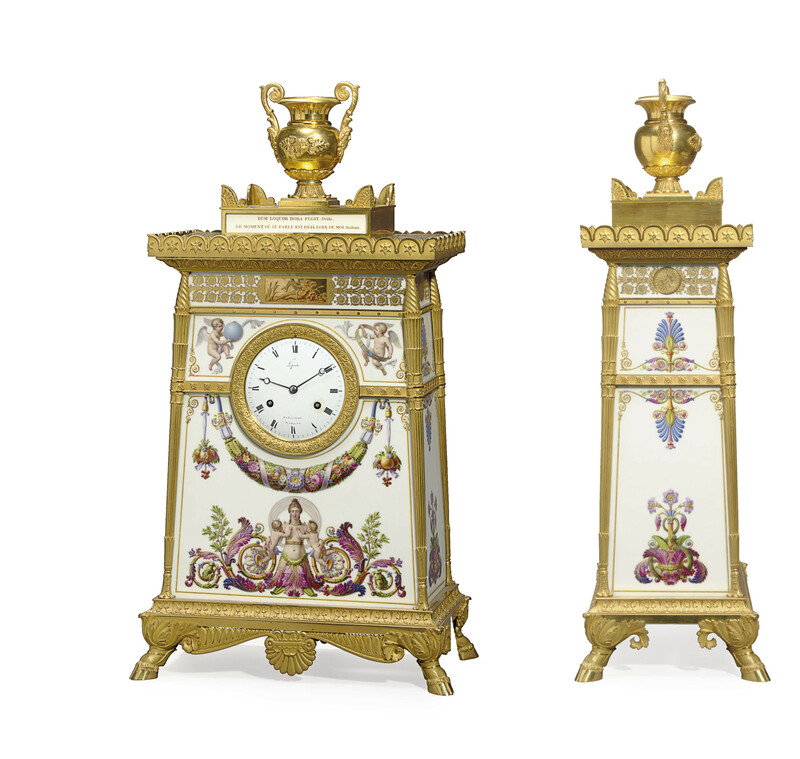 Design for this clock by Jean-Charles-François Leloy, 1820.